France is a nation synonymous with wine in the minds of people throughout the world. Never mind that arguably, French wine conditions are so temperamental as to make the production of the famed Bordeaux Pinot Noir – to use but one example - a complete lottery, France still wears the crown vis-a-vis the Vineyard and its produce. This is even is spite of the fact that some very reputable New World producers make French Style wines that leave even the experts impressed (except, in all probability, the very patriotic French ones). Wine in France is a matter of national pride and a matter of financial security. Its links historically to the clergy and the State have been so strong as to make wine something of an institution, and where in many faiths and denominations abstinence from alcohol is preached Cardinal Richlieu (French Clergyman and Politician, 16th C.) once echoed public opinion: ‘If God forbade drinking, would He have made wine so good?’. Little has changed as seen recently, when following a meeting with Vladimir Putin, new French President Sarkozy gave a press conference appearing to be sizzled. In the U.K. such behaviour would result I calls for recognition. In France it did not earn a gallic shrug even. The only question may have been over whether it was French Wine he has been drinking! 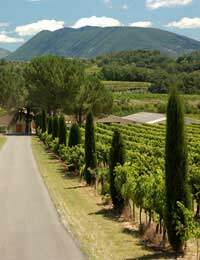 As mentioned throughout this site French wines are subject to strict regional controls. The Appellation d’Origine Controlee system was the first regional system in the world passed in 1935, although similar systems go back as far as the 16th C. in France. These systems set the boundaries in which wines may be made. The controls also govern what type of grapes may be used to make wines within a certain region. Cheese and Poultry are also subject to Appellation Controls. Though the French are big consumers of Wine, France also enjoys a huge (though dwindling) export market. This market is buoyed by the reputation of the major French Wine Regions: Champagne, Loire Valley, Burgundy, Rhone, Bergerac, Bordeaux, Provence. A myth surrounds these regions, one that certainly adds to the enjoyment of French Wine, and although it may be said that for all of these regions a New World equivalent can be found, for Vintage Bordeaux and top end Sparkling, France still gets the judges vote. This has been helped in part by the fact that in many countries wine was a considered a ‘French’ thing for a such a long time. Francophilia, which extends across parts of Europe and the New World dictates that the French will enjoy a top reputation for Wine even when logic, finances and taste sometimes dictate otherwise. French Wine has one major ally that contributes to the high reputation of their wine, French Cheese, the one thing that the French definitely, undoubtedly do better then any other food and drink nation. It is in partnering French appelation controlled Cheese and appelattion wine that the wine really comes into its own. Cheese became closely allied with wine historically as it was noted that dairy products helped to cut through the tannin and acid tastes of wine (milk is used in tea for a similar reason). Over centyries it is natural that in each region wine and cheese pairings have developed hand in hand. Try, for example, a White Bordeaux such as Bourgogne Chardonnay ‘Recolte du Chateau de Chassagne-Montrachet’ (2006, retailing at around £12 a bottle) with a certified Appellation d’Origine Controlee Eposses Cheese – a heady and well matched combination! See rleated articles on specific French Wine regions, the charcteristics of their wines and the ideal cheese pairings.